BELLIN -Carte Hydrographique de la Baye de Cadix..
BELLIN,J.N. - Carte Hydrographique de la Baye de Cadix..
Carte Hydrographique de la Baye de Cadix.. - BELLIN,J.N. Size : 22.0 x 34.5 inches. / 56.0 x 87.6 cm. 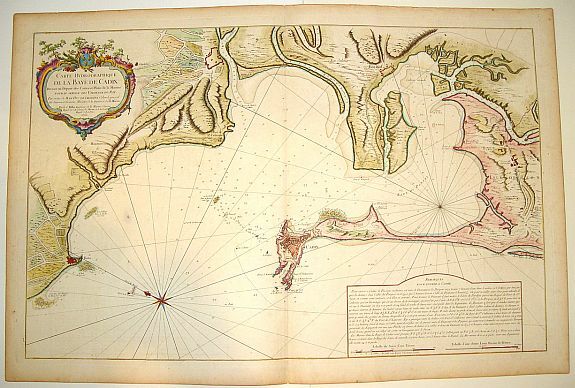 Description :A large and very handsome chart of the Bay of Cadiz, from the town of Rota to Cadiz. The piece contains dramatic coastal topography, forts, anchorages and soundings. Beautifully enhanced with an impressive decorative cartouche and a compass rose. Condition : A few unobtrusive foxing spots, else in very good condition. Engraved on thick strong paper with good margins.